The Northwest is down to two bids to Nationals this year from last year’s three and Seattle Sockeye, Portland Rhino, and Vancouver Furious George will battle it out for those spots this weekend in Tacoma. Who will be headed to Frisco next month? Sockeye is sitting comfortably at the top of the Northwest rankings, a position they’ve gotten used to over the past few seasons. At #2 in the nation, they’re ranked comfortably above #12 Rhino and well above #31 Furious George. Getting knocked out of prequarters at Nationals 2014 by Rhino, and, subsequently, not making the Pro Flight for the first time since the Triple Crown Tour started surely stung; the Fish seem ready to reassert their dominance on the national stage. After a disappointing fifth place finish at the Elite-Select Challenge, Seattle handily beat Revolver 13-9 in the finals to win the highly competitive Pro-Elite Challenge. Though their performance in major tournaments this season has been somewhat uneven, the team looked confident and strong at the Pro-Elite Challenge. Their O-line was solid, and their D-line continually shut down Revolver’s offense, which struggled to move the disc upfield. Sockeye’s performance at the Pro-Elite Challenge (which included a win over Johnny Bravo in the semifinals) was strong enough to propel them to the top of the rankings, despite their fifth place finish at their other major tournament this season. Sockeye has lost a few key players this year, including Tyler Kinley and Nate Castine, but they still have a deep roster of extremely talented veterans including superman receiver Matt Rehder. 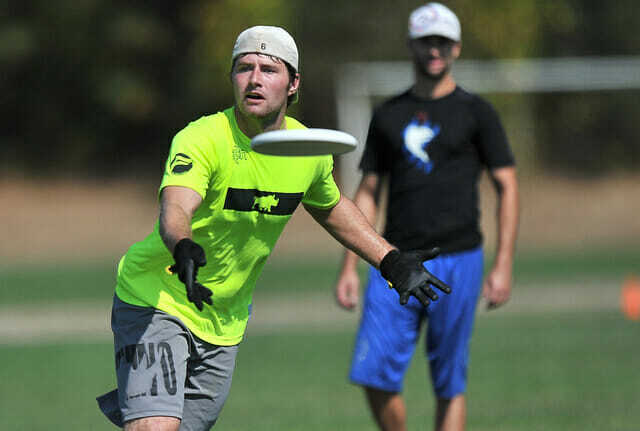 They’ve also picked up Mark Burton, who helped lead the dark horse Seattle Mixtape to a second place finish in the Mixed Division at Nationals in 2014, and Zane Rankin, coming off a season with the Seattle Cascades. There are some unanswered questions about Sockeye at the national level, particularly because of their short regular season (they played in just two tournaments). Rhino will probably give them a heck of a game in the final, but it’s still Sockeye’s to lose. Rhino may have missed out on Nationals in 2013, but they came into the tournament last year with a vengeance. They were the number one seed in last year’s Regionals and later showed why, with a huge upset over Sockeye at Nationals in prequarters. They then went on to take Seattle’s place in the Pro Flight. In their one contest with Seattle this year, at the Colorado Cup, they lost 10-13, as Sockeye went on to win the tournament. They finally know they can beat them in a high pressure situation, though, and will be looking to do more than just qualify at Regionals. Rhino has bigger fish to fry than Sockeye this year, however. They have a dynamite offense, led by center handler Eli Janin, that should prove a challenge for every elite team. Fifteen players are coming off a winning season with the Portland Stags, and five just placed second at the 2015 College Championships with the University of Oregon. The main core of the team has remained constant, with Jacob Janin and Dylan Freechild leading the team together for a second year. The team also had an impressive performance at the high-level Pro Flight Finale, breaking seed and taking down Ring of Fire to finish fifth. Their participation in the Pro Flight, playing against some of the best teams in the country, has shown that they’re ready to emerge on the main stage. Simply put, it’s been a rough season for Vancouver Furious George. They picked up a couple of wins at the US Open, but lost in the ninth place game to Temper, and they lost every game at the Colorado Cup, but did give first seeded Revolver a run for their money with a 10-13 game. The team was gearing up for the Canadian Ultimate Championships, where a win would have given them another trip to Worlds as Team Canada. But for the first team ever, Furious lost a CUC match, falling to Toronto GOAT in the final. Despite that loss, the team did look sharper at CUCs and won’t just roll over at Regionals. There is plenty of talent there to challenge the top two seeds, though there is no question that Sockeye and Rhino are more talented and should be expected to win. The team remains in flux, with much of their old guard having left the team in the last two years and new, young talent taking the reins. It is clear that their rebuilding has carried through into this season. Utah teams have not traditionally been a huge presence in the region, but the Powderhogs are looking to make a name for themselves. Coming out of Salt Lake City’s growing ultimate scene, these underdogs have been steadily gaining traction. At last year’s Regionals, they upset Voodoo and played Furious George in the game-to-go to Nationals. Although they lost, finishing fourth in the region was a significant moment for Utah ultimate. This season, they advanced to the semifinals in the San Diego Slammer, blowing past their 11th seed. They got to play with some of the top teams in the nation at the Elite-Select Challenge. They won both their home tournament, Ski Town Classic, beating Voodoo 15-6 both Saturday and Sunday, and Big Sky Sectionals, handily defeating all teams they played in bracket play and edging out Warchild 12-11 to win the section. The Powderhogs may not be ready to contend with Sockeye and Rhino, but they’re only ranked one spot behind Furious George, and are coming off the momentum of two tournament wins in a row. Voodoo has long been a solid second-tier team in Seattle, and an influx of young, talented players this season has propelled the team to a decent season. Eight players played on a YCC team this year, products of the exemplary youth ultimate scene in Seattle. Considering those players are, at most, 19, they most likely have many years of high level club ahead of them, which speaks to the potential of Voodoo in its current form. Voodoo went 5-2 at the CBR Memorial Tournament, with one of those losses coming as a final round forfeit due to low numbers. They also managed to place second at the Ski Town Classic with a skeleton crew of 12 men, losing only to the home team and tournament champions Powderhogs. They came into Sectionals as the top ranked team, and, though they were upset by fellow Seattlites Ghost Train, they still came in second in the section. With a roster at full potential, and presumably better conditions than the abysmal wind at Washington Sectionals, Voodoo will be looking to take down some older and more experienced opponents. This year’s Regionals features a number of new teams and teams that did not qualify for Regionals last year. Ghost Train¸another Seattle team, is made up of a talented group of friends who value spirit above all else and aim to prove that teams can be extremely spirited and also very competitive. Their defeat of Voodoo at Sectionals to clinch their spot at Regionals show they can contend with established teams, and, win or lose, they will most likely still be having the most fun at the tournament. Anger Management is basically a team of retired Sockeye All-Stars, including Moses Rifkin, Ben Wiggins, Adam Holt, and more. They won the section, calmly hucking deep against the wind while other teams faltered, showing that they’ve seen and done it all. Expect an awesome game if they get to play against their friends and former teammates on the current Sockeye roster. Big Rock Masters declined their bid, giving KING another weekend to play that they were not expecting. Regional returners Warchild, Killjoys, and Dark Star will have some good games against the lower half of the regional qualifiers. Comments on "Sockeye, Rhino Head For Another Showdown: 2015 Northwest Men’s Regional Preview"